Born: September 25, 1800 in Plymouth Ma. Died: May 4, 1876 in Sandwich Ma. at 75 yrs. 1. Elisha Covill, Jr.; (April 6, 1821 – August 18, 1867); Elisha, Jr. died at 46 yrs, 4 mos, 12 d. & was unmarried; He is buried in Pocasset Cemetery. 1. Martha Ann Landers Covell; (October 5, 1827 – May 22, 1891); Married David Covell (1822 – 1898) (Eli Covell & Patience Brooks) in Sandwich Ma. on November 8, 1846; Martha & David are buried in Rural Cemetery in New Bedford Ma..
2. Robert H. Landers; (July 25, 1829 – December 1, 1913); Married (1) Lydia Smith (1828 – 1859) (John Smith & Sarah Seeley) in Phillips Me. 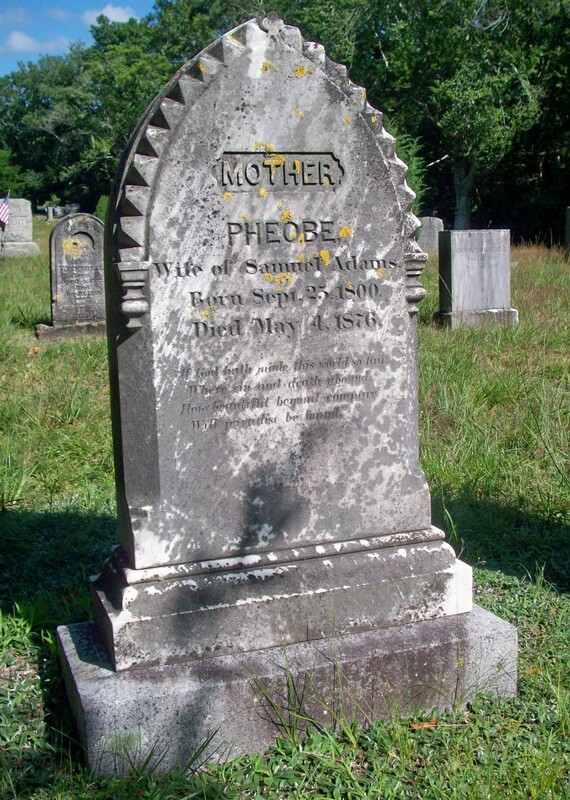 on January 30, 1855 & married (2) Sarah Jane Richardson (1836 – 1917) (Increase Blethen Richardson & Mary Coburn) in Phillips Me. ; Robert died in Mars Hill Me..
3. Samuel H. Landers; (September 17, 1831 – October 14, 1893); Married Mary Amanda Lumbert (1840 – 1923) (Ansel Lumbert & Clarinda Wright) in Sandwich Ma. on September 15, 1864; Samuel, Mary & their 3 children are buried in Pocasset Cemetery. 4. Theresa M. Landers Witherell; (July 12, 1834 – April 23, 1882); Married Anson Decatur Witherell (1831 – 1897) (Anson Witherell & Joan Morton (Jenkins)) in Pocasset Ma. on November 7, 1852; Theresa & Anson are buried in Pocasset Cemetery. 5. Abial Landers, Jr.; (July 19, 1838 – October 11, 1839); Abial, Jr. died at 1 yr, 2 mos, 23 d. & is buried in Pocasset Cemetery.